While the opening day of the 2017 Inglis Melbourne Premier Yearling Sale again attracted huge crowds and solid trade, the Oaklands Junction ring came alight on Monday with the record for the highest priced yearling knocked out of the park. By the time Gilgai Farm’s Lot 259, an I Am Invincible colt from the Encosta de Lago mare Soorena, had departed the scene, a new high of $1.4 million had been established. Previously, the highest priced Melbourne yearling was $750,000 for an Exceed And Excel colt from the Three Bridges’ draft in 2008, but a determined Robbie Griffiths and equally determined Ciaron Maher soon saw that figure consigned to history’s dustbin. Griffiths’ enthusiasm was predictable given that he trains the colt’s half brother, 2016 Group One Newmarket Handicap winner, The Quarterback, but Maher was relentless and eventually got the nod. The colt is also a half brother to four other winners including Group Two ATC Tulloch Stakes winner, Philippi, and stakes-placed, The Rude Warrior. Rick Jamieson’s Gilgai Farm, which also bred Melbourne graduate, Black Caviar, and, coincidentally, Maher’s Caulfield Cup winning mare, Jameka, had the honour of consigning the record-breaking colt. Rick told Racing.com that he was absolutely thrilled with the result. “I never expected it. I knew the horse would go well. Probably three months ago, I thought his value might be around the $600,000 to $800,000 mark. Rick indicated he will keep a share in his much-loved colt. In superb news for Victoria, the top 12 highest priced lots were all sold through Victorian vendors. Notably, two vendors with smaller drafts, Stockwell Thoroughbreds and Bombora Downs, both made the list (below). The 2017 Melbourne Premier Yearling Sale has been declared “a resounding success’’ as records tumbled and overall figures increased across the board. At the conclusion of Session I on Tuesday, the sale’s average was up 11% to $122,977, its median up 18% to $100,000, gross increasing by 2% to $52,880,000 and a “very healthy’’ clearance rate of 85%. 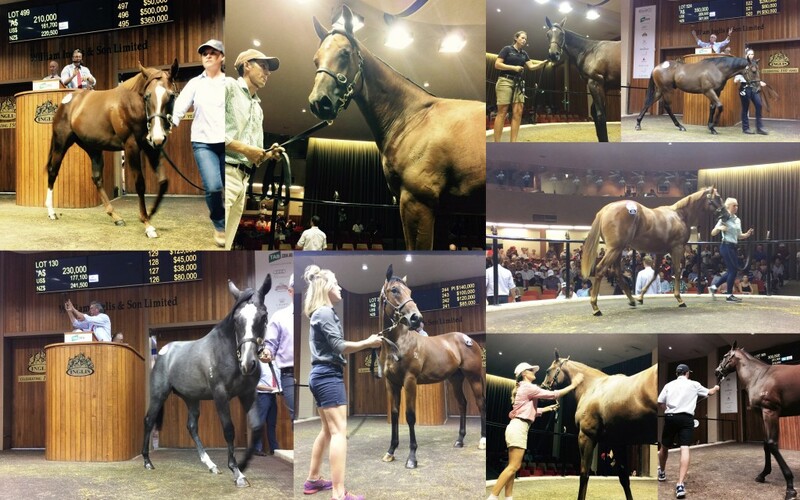 Victorian vendors sold the top twelve highest priced horses. These vendors included Gilgai Farm, Rosemont, Millford, Lauriston Farm, Supreme Thoroughbreds, Blue Gum, Burnewang North, Stockwell and Bombora Downs. Gilgai Farm’s Lot 259 (I Am Invincible x Soorena) was the highest-price colt – as well as a Victorian record and the most expensive yearling sold in the world so far in 2017 – at $1.4million. The $500,000 price tag for Surpreme Thoroughbreds/Dorrington Farm’s Lot 496 (All Too Hard x Fuhrnatic) made her the most expensive filly. Amazingly 25 different sires were represented among the 63 Lots purchased for $200,000 or more. This included Victorian based sires Written Tycoon, Zoustar, Magnus, Fiorente and Street Boss. Brent Grayling from leading vendor Supreme Thoroughbreds described the results as “extremely satisfying’’. “We’re called Team Supreme and it really was a supreme team effort,’’ Grayling said. “We felt we had a good draft coming in and the addition of Rob Crabtree’s Dorrington Farm horses took it to a new level. 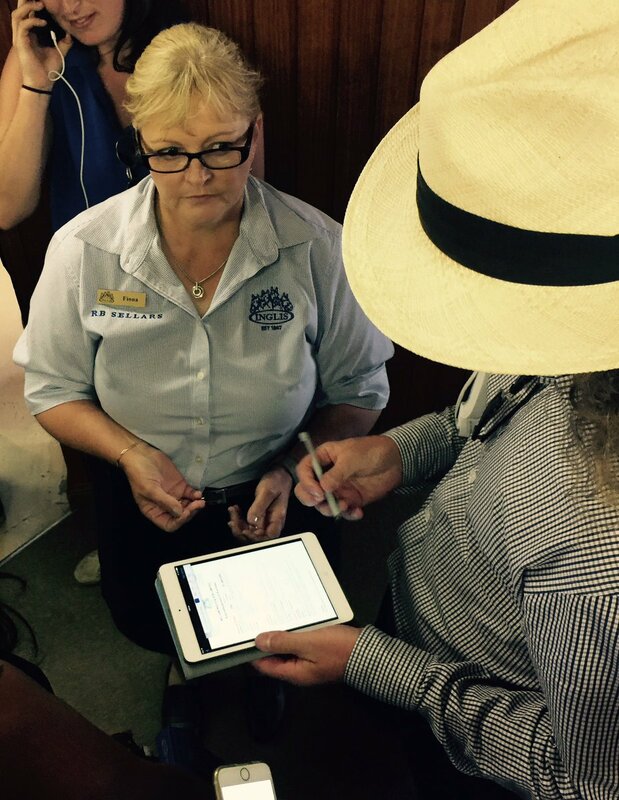 Inglis’ Victorian Bloodstock Manager Simon Vivian couldn’t have been happier with the results. “The end result is so pleasing on every front,’’ Vivian said. “The vendors did a great job presenting the horses and were rewarded accordingly and the buyers bought very well with some extremely high quality yearlings in the catalogue. 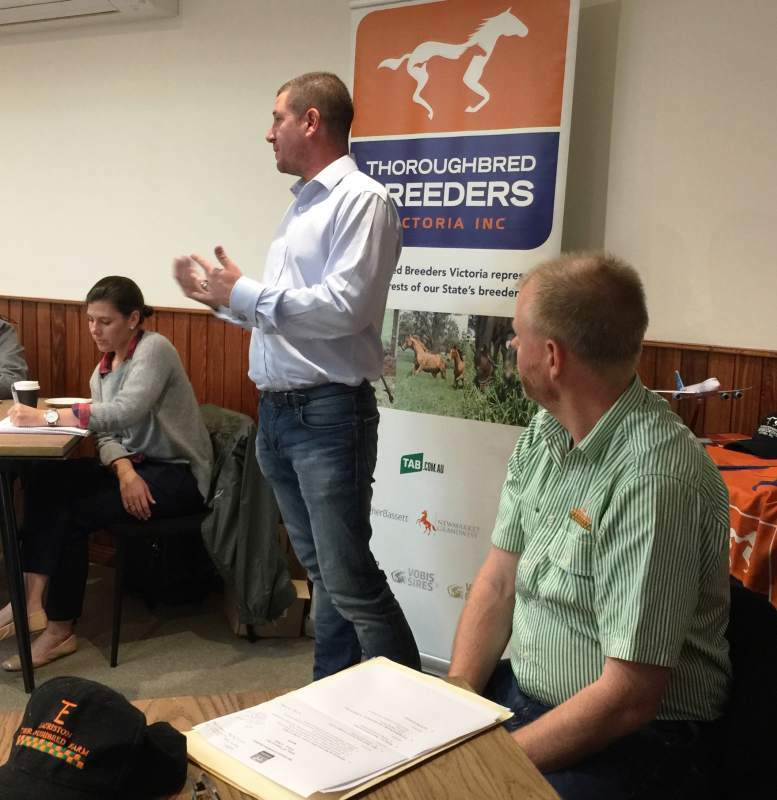 A bit of breakfast, a cup of coffee and breeding industry issues were to the fore at the TBV Industry Consultation Breakfast last Friday at Oaklands Junction. Speakers included TBV President James O’Brien, Racing.com’s Shane Anderson, Thoroughbred Breeders Australia CEO Tom Reilly and Simon Vivian from Inglis. The breakfast provided an opportunity to Victorian breeders to put forward queries, ideas and recommendations across the broad range of industry issues. Matters raised were varied and included those relating to VOBIS administration, foal ownership declarations, Stud Book concerns and breeding content on Racing.com. It was also an opportunity for industry members to socialise and discuss prospects going into the big sale week. TBV is thankful to those who attended including visiting guest speakers. Anytime a breeder has a filly or mare salute on the racetrack is cause for celebration. And having two win on the same day might result in a jolly good dinner. But what do you do if they you have two wins on the same day, at the same racetrack and both in prestigious Group 1 races? Well, Victoria’s own Robert and Sylvie Crabtree of Dorrington Farm had just that dilemma on Saturday after a Group 1 double at Caulfield. Firstly, two year-old filly Catchy (Fastnet Rock) saluted in the Blue Diamond Stakes with a withering run over the last furlong. Just forty minutes later, the Lindsay Park trained five-year-old mare Sheidel (Holy Roman Emperor) lead and scored in one of Australia’s most competitive Group 1 races, the Oakleigh Plate. As a long time servant of the Victorian breeding industry, including as President of TBV, Rob could not be denied the success. 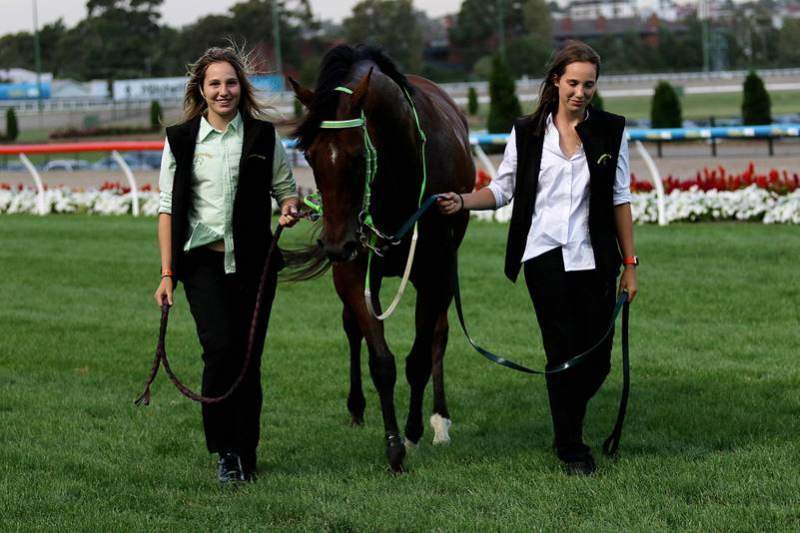 The two top shelf wins certainly add enormous value to the two females who, at the end of their racing careers, will call Dorrington Farm home. “..that is the aim, they are to replenish the broodmare band and with five stakes winning females racing at the moment that’s what replenish is all about,” he said. Ridden quietly from a wide gate, Catchy zoomed home out wide to win by a long neck over the Snowden trained Pariah. It was trainer David Hayes’ sixth win in Victoria’s premier juvenile race and the filly is now a genuine chance at being aimed at the Golden slipper in Sydney. 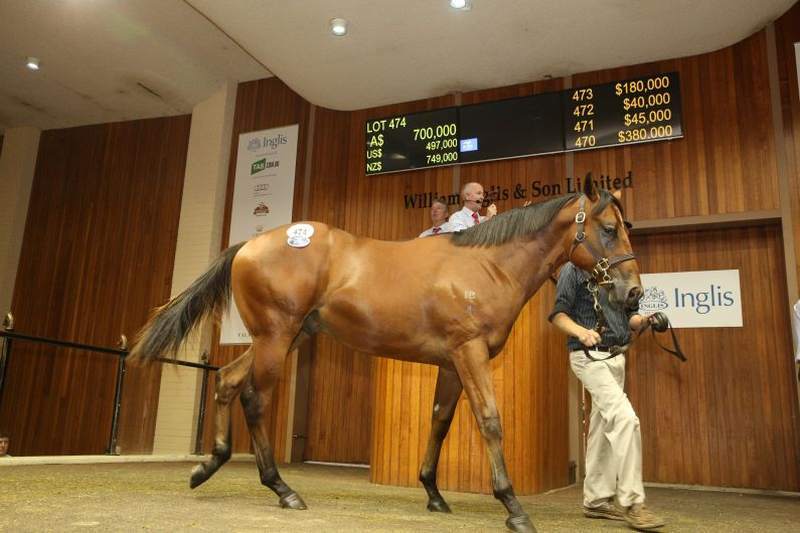 Rob Crabtree bought Catchy for $220,000 at last year’s Inglis Australian Easter Sale. 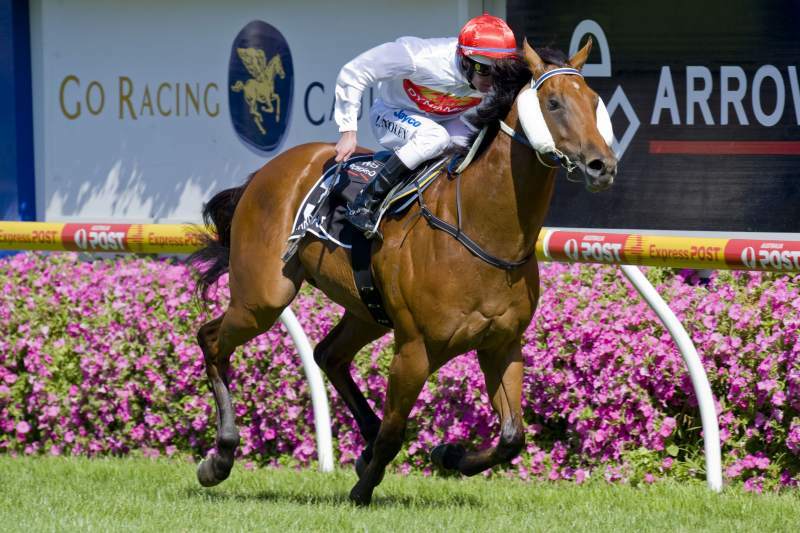 She has paid that back in spades having been unbeaten in four starts earning $1.1 million in prize money. Catchy caught Roberts eye straight away. “I think that’s the ultimate test, I thought she was terrific value, from a Group 2 winning mare, a big strong horse, I really fancied her,” he said. Sheidel was another Crabtree buy although, by the time of purchase, she was already a tried and tested wonder sprinter from Western Australia. Before travelling east to Victoria, she had amassed 11 wins including three black type wins. Saturday’s premier win was her fourth win in Victoria over the past twelve months all of which have been black type victories. Her career prize money haul is now approaching $1.6 million. That success also included a second to Takedown in the Group 1 WATC Winterbottom Stakes at her previous start in November. “She really deserved it. 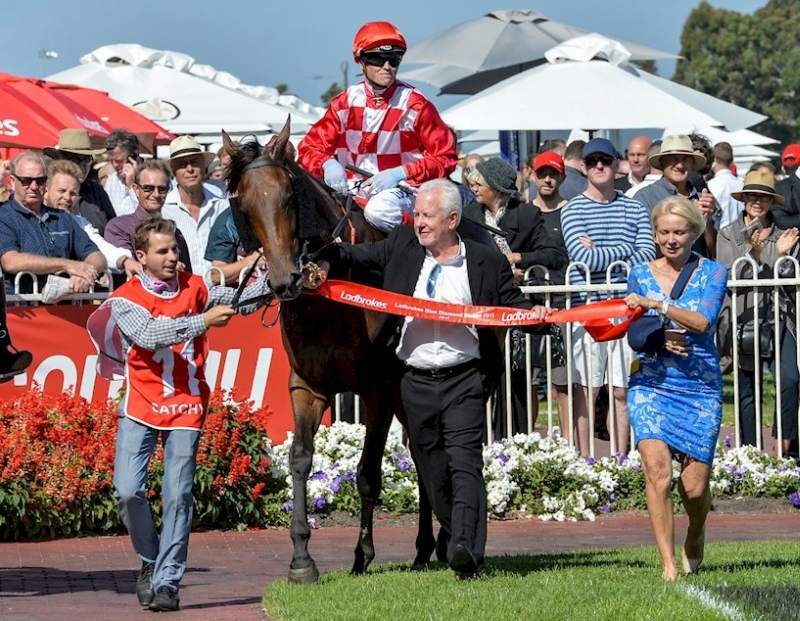 She has been narrowly beaten in a couple of Group 1s and today, she travelled and never looked like she was going to get beat,” co-trainer Tom Dabernig said after Caulfield’s big win. Sheidel is a half-sister to stakes-winner Latoria and is the best of three winners from Laventour, a half-sister by Metal Storm (Fr) to Group 3 winner Track Jester. Inglis Premier Sale note: The Crabtrees’ magic touch continued at the Inglis Premier Sale this week. Dorrington Farm had 11 yearlings offered through the Supreme Thoroughbreds draft. Top price was $500,000 for the All Too Hard-Fuhrnatic filly while a Magnus colt fetched $215,000 and a Pierro filly was sold for $210,000. The past fortnight has seen a rush of winners by Chatswood Stud’s Reward for Effort and perhaps the best of them came on Friday night. The Darren Weir trained filly Brugal Reward collected the Group 3 Typhoon Tracy Stakes becoming the tenth winner over ten days for her sire. The black type win was particularly satisfying for Chatswood principal Greg Willis and the Seymour based team as she was bred and raised on the farm on the banks of the Goulburn. “We actually got a loan of the mare from Robyn and Paul Radford who owned Apache Cat as they were not using her, so we sent her to Reward For Effort and Brugal Reward was the result of that mating,” Greg said. It’s also a nice connection as the dam, Tiger Tess, is a half-sister to Champion Sprinter and eight-time Group 1 winner Apache Cat, one of Chatswood Stud’s best graduates. Brugal Reward had won at Moonee Valley at her previous start, but an outside barrier threatened to cruel her chances of s second consecutive win at the track. A late charge home around the field under young jockey Ben Allen, saw her grab a close win in the 1200 metre race. The filly was bought by John Foote Bloodstock for Darren Weir at session two of the 2015 Inglis Premier Sale for $45,000. With three wins across thirteen starts, she has now earned $180,000 for connections. Brugal Reward is the fourth stakes-winner for Chatswood Stud’s Blue Diamond winning sire Reward for Effort. He has now crept into the Top 50 sires of Australia with his seasonal progeny earnings exceeding $1.75 million. Reward for Effort is also the leading third season sire by winners, placing him in front of the likes of Star Witness and Hinchinbrook. Greg said Brugal Reward was typical of a Reward for Effort. “They are a similar type, strong with plenty of bone and bred on the hills. We are not breeding show ponies, we are breeding good strong racehorses.” he said. Devoted and passionate Kilmore breeder June Fletcher is over the moon once again following the win of one she bred, Benz, in the Group 3 Ladbrokes Zedative Stakes at Caulfield. Now into her 80’s, June, a retired schoolteacher, can focus on her love of breeding, and although she can’t keep them all and race them herself, she is never far away when they run. June and her late husband Jim bought a farm at Broadford in 1970s and made Benz’s granddam, Prospice, their first broodmare purchase. “We bought Prospice from a long time friend in Ed Barty, a TBV Life member who ran Trevenson Park Stud at Maldon,” June explained. “Prospice went to Encosta De Lago in his first year for a service fee of just $9,000 – not the $200,000 charged later in his career!” June spoke of the mating that produced Benz’s dam Mycedes. June is an ardent student of the horses she breeds. Just like the children she has taught before, she enjoys watching the horses she has bred go off and spread their wings. She makes every effort to see them up close at the track and, if the travel challenge is too greate, makes sure she watches them on the television. This was Benz’s first start since a thirteen-week spell, having run three fifth placings in a row. These races during the Melbourne Spring Carnvial included the Listed Durbridge Stakes, Hilton Stakes and the Group 2 Sandown Guineas. Having five straight wins before that, he has really enjoyed the break and come back in great form. Trained by Gordon Richards at Morphettville, Benz motored under Blake Shinn in the $150,000 Zeditave Stakes over 1200 metres..
“I was a bit worried that he had to do all of the legwork chasing the two tear-away leaders but he was strong on the line and he put them away, I was very happy,” Richards said. It was Benz’s sixth win from just his tenth start and bring his earnings to just a tick over $280,000. That’s not bad for a $37,000 purchase by his trainer out of book two of the 2015 Magic Millions Adelaide Yearling sale. He is the seventh foal of the unraced Encosta de Lago mare Mycedes whose dam Prospice (Scruples) is a daughter of the Group 1 South Australian Oaks winner Brunisse. Six of Mycedes’ foals won at the track, including the very handy city winning mare Mybenz (Danbird), but unfortunately June lost the dam in 2015. 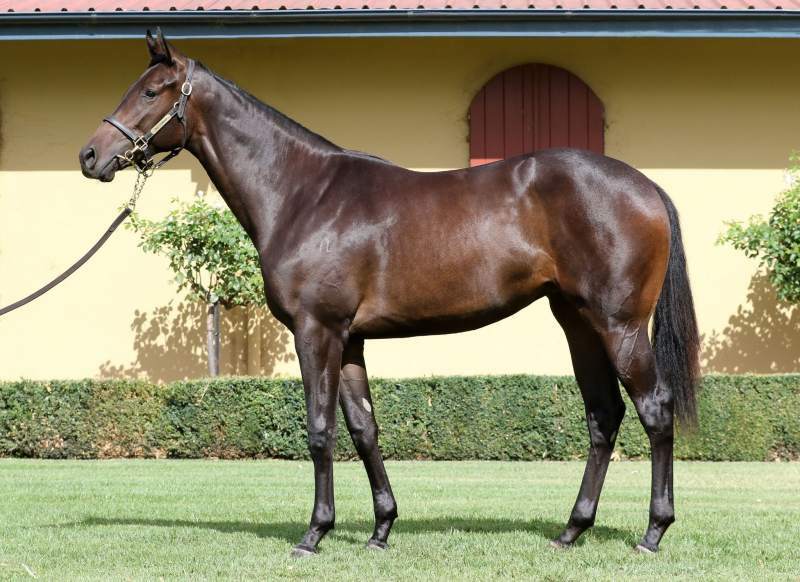 She leaves behind the talented Benz as well as a two-year-old colt by Magnus, Benzagain bought by Seymour farrier John Pittard as a weanling. Unraced as yet, he is in the stables of Caulfield conditioner Stuart Webb. June maintains ownership in the family having kept a share in Benz’s half sister Andronica (Mujahid). Andronica now has a yearling filly by Bushranger making her a three-quarter sister to Benz. Andronica was covered by Americain last season. Astute trainer Mick Kent gave Nigel and Meredith Berry and their Illowra Stud a night to celebrate last Friday when two of their homebreds saluted at the Valley. First to win was the talented Comic Set in the opener, the William Hill Handicap over 1200m. Comic Set, is a son of Reset out of the Distorted Humor mare Riddles, a winner in Brisbane from the family that produced outstanding stallion Hussonet. Meredith Berry said that Riddles unfortunately died during birth to Comic Set. “With the help of Malcolm Boyd from Bullarook Stud we were able to foster him successfully,” Merdith said. Oncidium Ruler gave the Berrys their second homebred win later in the night with the talented gelding enjoying the step up to 2500 metres. “He was determined today and should get a lot of confidence out of this run. A lot straighter, he will come on from this experience and win more races,” jockey Craig Williams said. Meredith recalls that Kent was first taken with Oncidium Ruler when he saw him in a paddock at their Nagambie based stud. Kent has trained for the Berrys ever since. Oncidium Ruler is the second winner for the Zabeel mare Princess Regina, who is also dam of the city placed four-time winner Za Za Zoom. Princess Regina paid a return visit to Helmet last season having produced a lovely weanling colt. Nigel and Meredith have a long and celebrated horse history both in the equestrian and thoroughbred racing sectors. Nigel was president of the Yarra Glen Hunt Club and represented Victoria in three-day eventing, being short-listed for the 1990 World Equestrian Games. They purpose bred event horses and started the long running and popular Yarra Glen Pony Club ODE. Nigel’s passion for breeding thoroughbreds actually came from his experience in genetics when he used to breed and show chickens as a child in Footscray. When at the show grounds one day, he visited Flemington next door during a race meeting and was hooked. With the help of renowned jumps trainers Dennis Heather and Stan Craddock, he learnt about handling and training thoroughbreds and point-to-point riding. And the Berrys haven’t looked back since. It’s fair to say Ridgeview Park’s Phil and Fiona Sloane had a tough start to 2016 having lost two of the farm’s stallions, Dr Doute’s and Bianconi, to illness. But the bright sun is certainly coming up over the horizon at Muskerry East with a new stallion they secured for the 2016 breeding season. A Group 1 Champagne Stakes winner, Onemorenomore (Red Ransom), moved from Vinery last year to Ridgeview Park. “He is just great to handle, covers well, and a pleasure to have around,” Phil said. Since moving to Ridgeview, Onemorenomore has produced a slew of winners and perhaps his best was on the weekend when juvenile filly One More Honey won the Group 2 Sweet Embrace Stakes (1200m) at Randwick. Now a candidate for further juvenile black type success – perhaps even at Group 1 level like her father – One More Honey is out of the imported Distorted Humor mare One Funny Honey. Alongside the filly’s impressive victory, the stallion also had a Listed placegetter, a metropolitan winner and a provincial success on Saturday. 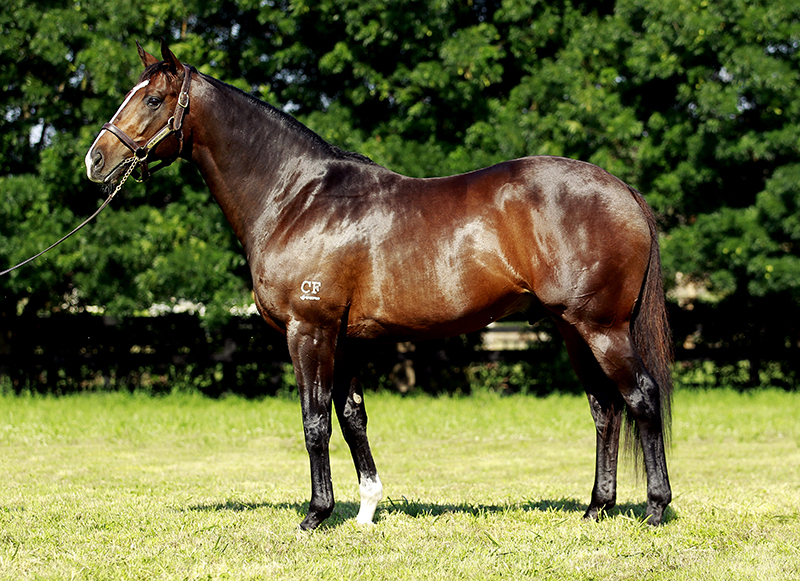 The sire is now on the verge of moving into the top fifty of the Australian sires premiership with 41 individual winners and close to $1.5 million in progeny earnings. The Sloanes just can’t wait for the next breeding season. “The success of One More Honey is just a great boost for his stud career and we are looking forward to more success with his progeny in the coming years,” Phil said. Last spring he served mares by the likes of Exceed And Excel, Danehill Dancer, More Than Ready, Encosta de Lago, Mr Prospector, Miswaki, Canny Lad, Testa Rossa and Danehill. TBV recently took Age reporter Michael Lynch on a tour of Victorian breeding farms in the Macedon Ranges and Nagambie regions. The following story by Michael was published in The Age on the 23rd of February. Victoria’s racing eyes may be firmly set on Caulfield for a huge afternoon of Group 1 action on Blue Diamond Day this Saturday, but trainers, owners and breeders will cast their gaze north to Oaklands Junction 24 hours later when sales house Inglis hopes to auction the first $1 million yearling sold in Melbourne. The Inglis sales at Sydney over Easter, along with the glitz and glamour that is the Magic Millions yearling sale on the Gold Coast every January, usually produce the highest-priced yearlings sold in Australia every year. 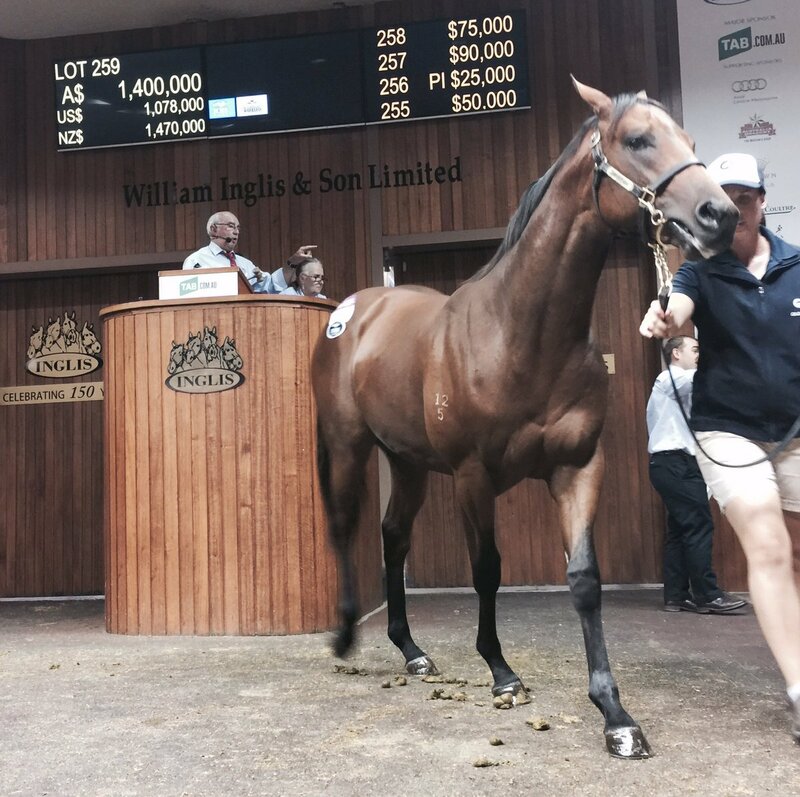 But the Inglis Premier Sale in Melbourne has become known as the place to find a real bargain. High-quality runners can be had for prices much less than they might fetch if they were sold in Queensland, where a series of multimillion-dollar, sales-related races for graduates of the Magic Millions auctions drive up prices, or in NSW, where most of the industry’s heavy hitters congregate over Easter. The Melbourne sales have, in recent years, thrown up a series of top-class runners headed up by the incomparable Black Caviar, who was sold as a yearling at Oaklands for $220,000 by Rick Jamieson’s Gilgai Stud, where a statue of the brilliant unbeaten racemare now stands as a legacy to her place of birth. The Victorian industry has been attracting serious investment and some major players in recent years as concerns over mining and resource industry development have cast a shadow over the famed breeding houses in NSW’s Hunter Valley, and local studs are hoping to capitalise over the uncertainty by making a statement at the Melbourne sales, which start on Sunday. Last year the most expensive yearling sold at the Melbourne auctions was the colt now named Ducimus, who was bought by Hong Kong interests for $700,000, while Three Bridges Stud got $750,000 for a son of Exceed and Excel in 2008. Ducimus, a son of Snitzel in the Team Hawkes stable, has already paid back $85,950 of his purchase price after winning both his starts, a maiden at Ballarat and the listed Talindert Stakes at Flemington last Saturday when he had to survive a protest from the runner-up after jockey Noel Callow caused interference in the closing stages. This year the Victorian industry and local studmasters are hopeful that the first youngster to crack the million-dollar mark will be sold at Oaklands, with Gilgai Stud’s half-brother to The Quarterback, the winner of the Group 1 Newmarket Handicap last season, set to go under the hammer. Described as an exciting type, the yearling is by the speedy sire I Am Invincible, who has already produced the group 1 winning sprinter and now stallion Brazen Beau, out of Soreena, whose union with Street Boss produced The Quarterback. Other high-profile lots for sale include a pair from Adam Sangster’s Swettenham Stud complex, a filly out of classy racemare Members Joy (also by I Am Invincible) and a colt by Redoute’s Choice out of Hidden Energy whose half sister last year sold for $625,000. But it’s not all about the big-money studs and the blue-blooded yearlings. As anyone who follows racing knows, pedigree only counts for so much, and many inexpensive horses have turned out to be champions. Two breeders hoping to make an impact at what will be their first foray at the Melbourne sales are husband-and-wife team Gary and Helen O’Meara, who run the small Miranda Park stud just north of Melbourne. Gary was for decades a teacher in Essendon, where his subject was Chinese, having met his wife in Beijing when the pair were students studying the language in the 1980s. Having retired from teaching humans, Gary opted to breed and teach young horses and he and Helen are looking forward with excitement and trepidation to their first exposure to the big time. “It’s something that we have always wanted to do and we enjoy the life on the farm and the horses, so hopefully our four will attract plenty of interest,” he says. The Miranda Park quartet is made up of three colts – by Reward for Effort, Artie Schiller and Reset – and a filly by Turffontein. The Artie Schiller colt could get a major boost if Blondie, a two-year-old filly to whom he is related, can pull off a surprise in Saturday’s Blue Diamond. The Victorian thoroughbred breeding industry will be on show this week when more than 500 Super VOBIS-nominated yearlings go under the hammer in Melbourne at the popular Inglis Premier Yearling Sale. A total of 771 yearlings from studs across the country have been catalogued for the sale that has previously produced champions including undefeated superstar Black Caviar, Hong Kong pin-up Sacred Kingdom and seven-time Group 1 hero Weekend Hussler. Among the yearlings to be offered for sale are close relations to Group 1 stars The Quarterback, Pear Tart and Precious Gem, as well as the progeny of Stakes winning-mares Members Joy, Lady Melksham and Oasis Bloom. 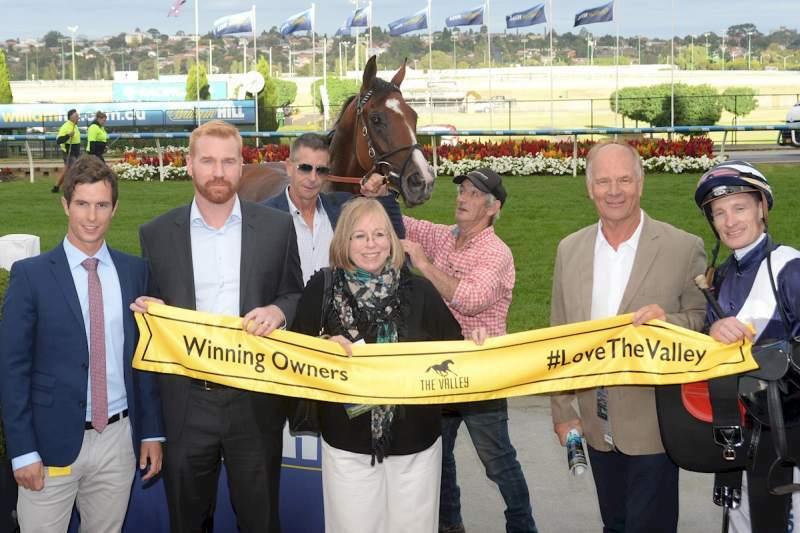 Racing Victoria’s (RV) Racing Operations Manager, Paul Bloodworth, said the sale presented an ideal opportunity for first-time buyers and seasoned owners alike to begin a journey of thoroughbred racehorse ownership in Victoria. “Inglis have done a tremendous amount of work to position its Premier Yearling Sale as one of the highlights on the Australasian thoroughbred calendar and the catalogue for the 2017 sale boasts some outstanding quality,” Bloodworth said. “More than 500 of the yearlings for sale have already been nominated for Super VOBIS, which presents owners, trainers and approved syndicate promoters with a fantastic opportunity to get involved in the country’s premier breeding and racing incentive scheme. “These Super VOBIS-nominated yearlings will be eligible for VOBIS Gold and, in most instances, the newly-introduced VOBIS Sires, with the three schemes collectively set to offer more than $20 million in exclusive prizemoney and bonuses. Indeed this Sunday, the first day of the sale in which 150 lots will go through the ring, will again double as an Inglis Open Day, presenting an ideal platform for the thoroughbred racing or breeding novice to rub shoulders with racing royalty and experience an action-packed day at the sales. Roving RV staff will be on hand across each day of the sale to discuss all aspects of Victorian thoroughbred racehorse ownership, including Super VOBIS, while trainers and owners are also encouraged to visit the new Wellbeing Lounge. Hosted by RV with the support of the Victorian Government and the Australian Trainers Association, the Wellbeing Lounge is an exclusive marquee adjacent to the sales ring where attendees can take a break from the hustle and bustle of inspections and the sale. Whether it’s taking a load off with a complimentary bottle of water in the Spelling Paddock’s bean-bag lounge or seeking some support from RV’s Trainer Wellbeing Liaison, there’s something for everyone in the Wellbeing Lounge. The Cancer Council will have a strong presence in the Wellbeing Lounge with pop-up activations from Sunsmart, QUIT Victoria and LIVELIGHTER, while Diabetes Victoria will also be on hand with valuable health information for attendees. More information about the Wellbeing Lounge is available here. The full list of Super VOBIS-nominated yearlings for sale at the Inglis Premier Yearling Sale is available via the Quick Reference Guide. A brilliant winner of the 2009 Group 1 MRC Blue Diamond Stakes, Chatswood Stud’s Reward for Effort has been churning out the winners this season and is currently engaged in a close battle with Star Witness for supremacy in the third crop sires division by winners. The handsome bay son of Exceed and Excel has posted 44 winners of over $1.6 million in prizemoney since August 1 including metropolitan winners this month such as Brugal Reward, Premium Reward, Bounce Down, Big Effort and Amaliemoo, while Gold Symphony won in Sydney in January and was also third in the Listed ATC Carrington Stakes. 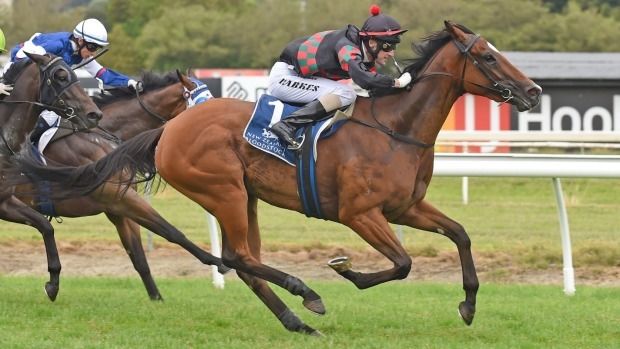 Reward for Effort has also had winners in Hong Kong, Macau and South Africa this year, while on Wednesday he added a new stakes horse to his tally with Tuff Bickie finishing third in the Group 3 Launceston Cup. His efforts have earned him a place in the Top 40 sires by Australian winners, not a bad effort given his oldest progeny are just four year-olds. 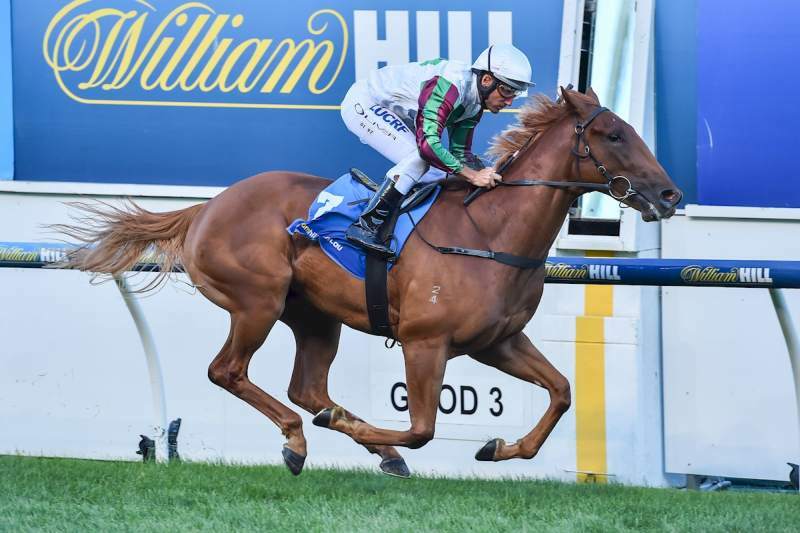 His exciting two year-old filly Blondie won on debut with authority at Moonee Valley last month for the Brendan McCarthy stable and has been given her chance to emulate the success of her sire in the Blue Diamond Stakes on Saturday. Blondie has drawn gate nine and will be ridden by Chris Symons. 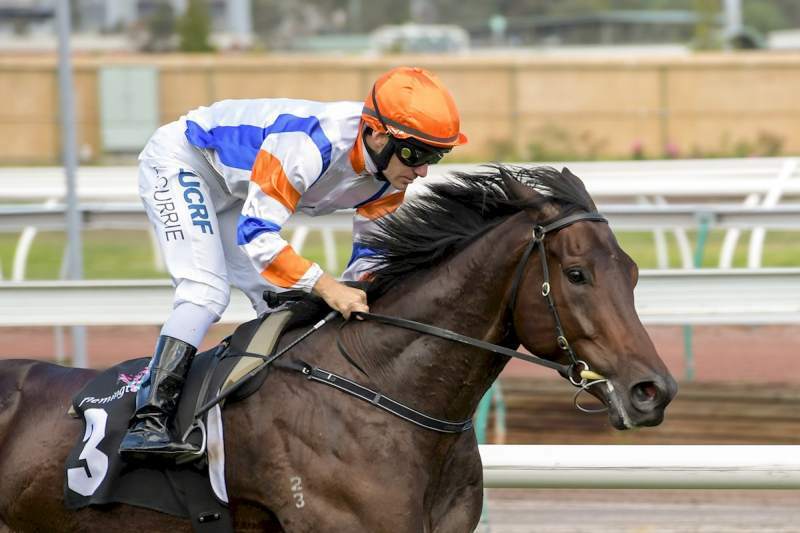 The Darren Weir trained three year-old Gratwick is another progressive type for Reward for Effort and gets his chance to step up on Saturday in the Group III MRC Zeditave Stakes (1200m). Group 3 placed at two, Gratwick has been racing consistently and comes into this race off a strong last start win at Moonee Valley. 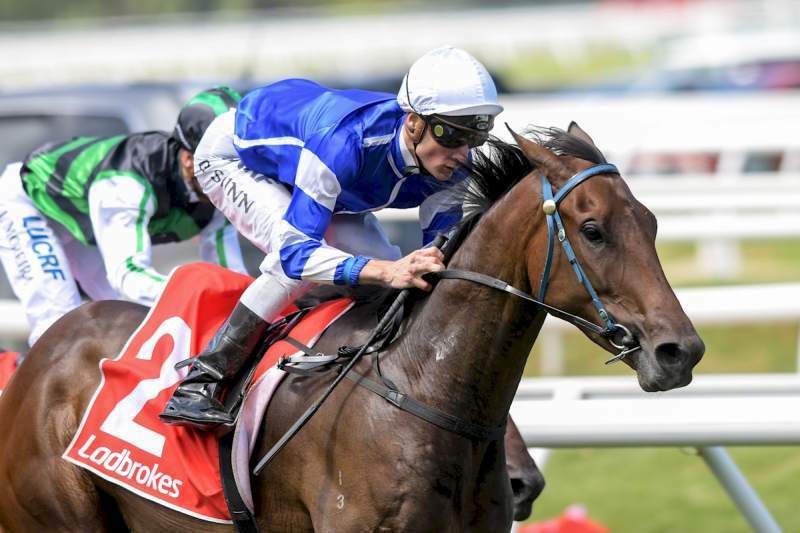 Other promising Reward for Effort runners heading for Black Type are Brugal Reward and Gwenneth, who run in the Group 3 MVRC Typhoon Tracy Stakes at Moonee Valley on Friday night and Intrice’s Reward, who runs in the Group 2 MRC Angus Armanasco Stakes at Caulfield on Saturday. Having covered increasingly better books of mares in every year he has been at stud, Reward for Effort had strong results at Inglis Premier last year with 14 yearlings averaging $97,500 and has another stellar draft of 22 for 2017. Below are some Premier highlights for Reward for Effort in Session 1 and click here to see his full draft. 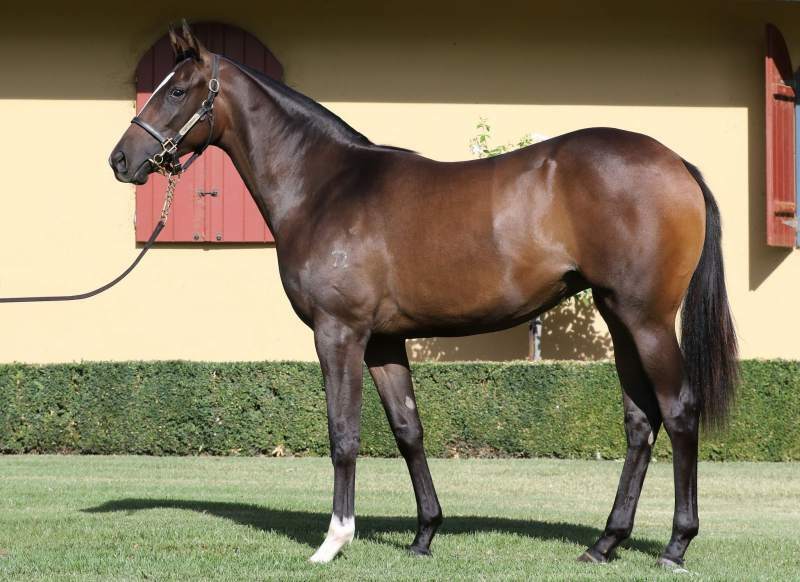 Lot 90 Colt Reward for Effort x My Southern Bell, by Octagonal – Miranda Park. A half-brother to Group III winner Flying Tristram. Lot 312 Filly Reward for Effort x Viva La Diva, by Barathea (IRE) – Chatswood Stud. Half-sister to six winners from SW Viva La Diva, a daughter of Blue Diamond winner Riva Diva. Lot 362 Colt Reward for Effort x Avelon Royale, by Falvelon – Supreme Thoroughbreds. Full brother to Effortless Power, who has won again since the catalogue went to print at Ballarat. Lot 389 Colt Reward for Effort x Bouchette, by Canny Lad – Supreme Thoroughbreds. Half-brother to four winners from stakes-placed Bouchette. 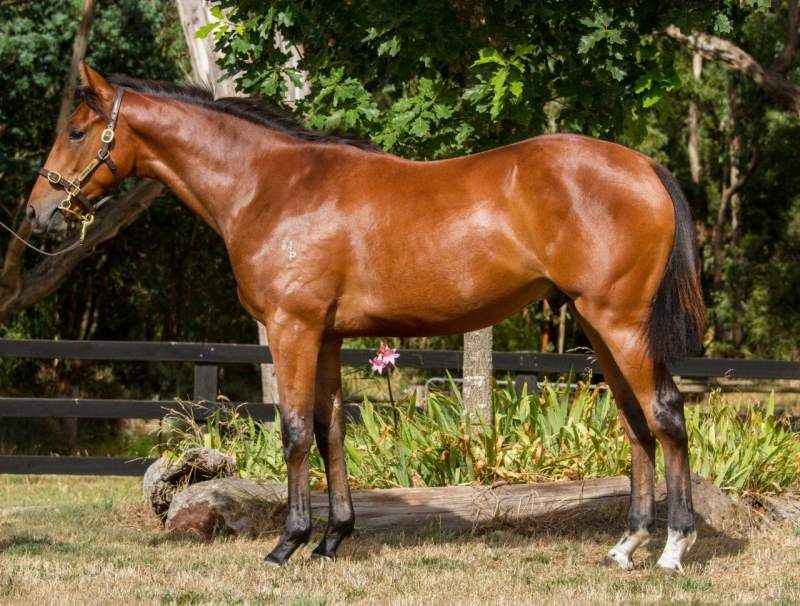 Lot 553 Filly Reward for Effort x Kobe Queen, by Fusaichi Pegasus (USA) – Willaroon Thoroughbreds. First foal of a winning daughter of Group III winner Queen Isolt. Breeding horses is a journey. From choosing a sire, finding a mare, watching a foal grow and hopefully seeing it race is a long one. And nobody knows that better than Western District farmer Michael Niall. Producing beef and sheep on their Coleraine property, Parkwood, with his late brother Donard, their family have always been involved in thoroughbreds. Michael recalls visiting the famous home of Phar Lap, Breaside Farm as a child, then run by the trainer Ernest Willmott. He remembers the magnificent stables and the private training track as they fed the horses of a Sunday. The Niall brother’s bred their first winner, Miasma, in the 1950s after sending a mare up the road to Meadow Mist, which stood at former Victoria Racing Club Chairman, Sir Chester Manifold’s property at Camperdown. But not only have they been great long-term supporters of the Australian breeding industry, the Niall’s have also enjoyed breeding and racing horses abroad. Their interest in American racing was sparked by the visit of Johnny Longden, an American Hall of Fame jockey to Australia. Invited by the Melbourne Racing Club, he rode over 6000 winners and was the only jockey to ever ride and train a Kentucky Derby winner. The brothers purchased several broodmares during a trip to Kentucky in the mid 1990’s. Travelling back in 2009 they inquired into stallion services to southern hemisphere time, and sent two broodmares to the then unheralded Kentucky based stallion Tapit. The Nialls were able to secure the service at a cost of US$20,000. Today Tapit’s current fee at Gainesway Farm has risen to US$300,000 off the back of twenty-one group one winners, six champions and five Breeders’ Cups. The brothers sent two mares, one, Dontwaltzme, was a daughter of Afleet Alex that they had bred in the USA. Michael recalls that the name came from the old saying, “don’t take the mickey” out of me, while the other was a Jade Hunter mare named Jade Dreamer that they had purchased. Once safely in foal, they were sent to Australia where Dontwaltzme produced a grey colt and Jade Dreamer, a grey filly. The following year Jade Dreamer, who was in foal to High Chaparral unfortunately died in a paddock accident. As a result, the Nialls decided to retain the filly, named La Ballerine, to eventually breed with and they offered the colt for sale at the Magic Millions on the Gold Coast. Probably because Tapit as a sire was a mystery to most buyers, he was passed in for $220,000 against a reserve of $250,000, with the brothers naming him Derrymore. The Hayes trained Derrymore was the first Australian winner for Tapit, and had three wins and La Ballerine, after two race wins has retired and was covered by Trust In A Gust this season. Another great thrill in America was when their colt, Temeraine, a son of the stallion Arch, won twice at Churchill Downs. The Nialls also remember vividly breeding the top lot at the 2014 Fasig-Tipton Florida select sale of 2-year-olds in training. Kentucky bred, the Malibu Moon colt out of the unraced Pine Bluff mare Lizzy’s Bluff had been sold as a yearling for US$200,000 and in a very successful pinhook, he was the highest-priced juvenile of the sale at US$1.2 million, secured by Coolmore’s Demi O’Byrne. The bay colt was a sibling to three winners from as many foals to race out of the dam, including G3 placed stakes winner Please Explain and multiple stakes-placed Nicklaus Way. The Nialls French venture started when Australian bloodstock agent, Damon Gabbedy of Belmont Bloodstock secured a well-bred young mare named Main Spring for the Niall’s for €175,000 at the 2011 Arqana Breeding Stock Sale. Main Spring was a gorgeous mare by champion sire Pivotal out of the stakes winner Fairy Godmother. She is a half-sister to the son of Kingmambo, My Kingdom Of Fife, the Chris Waller trained import who won the prestigious G1 Queen Elizabeth, the G2 Hollindale Stakes, the G3 Craven Plate and the G3 Doncaster Prelude. Main Spring is from one of the best families in the European studbook, a direct descendant of the great Highclere and from the family of Nashwan and Japanese super sire Deep Impact. When purchased Main Spring was in foal to young sire Tamayuz. She foaled a smart colt that sold as a yearling for €55,000, before being sent to the Chantilly yard of Nicholas Clement. Named Royal Spring he showed early dash as a 2 year old, and saluted in the Listed Prix Saraca at Maisons-Laffitte, making Main Spring the dam of a stakes winner with her first foal. These days the Nialls are cutting back their numbers, but certainly not the quality – and although they have had many highs and lows racing horses, they are still in with a good chance that their champion will come along. Michael Niall has four yearlings presented for sale by Swettenham Stud at this year’s Inglis Premier Sale. With the following comments from General Manager, Brian Gorman they will be well received by astute buyers. Lot 392 – Bel Esprit x Brideshead (Pictured) – A lovely correct colt, very strong through the shoulder and hindquarter. Dam is a half sister to Please Explain, who is a listed winner and G3 placed. Please Explain was recently sold as a broodmare to WinStar Farm for $400k. 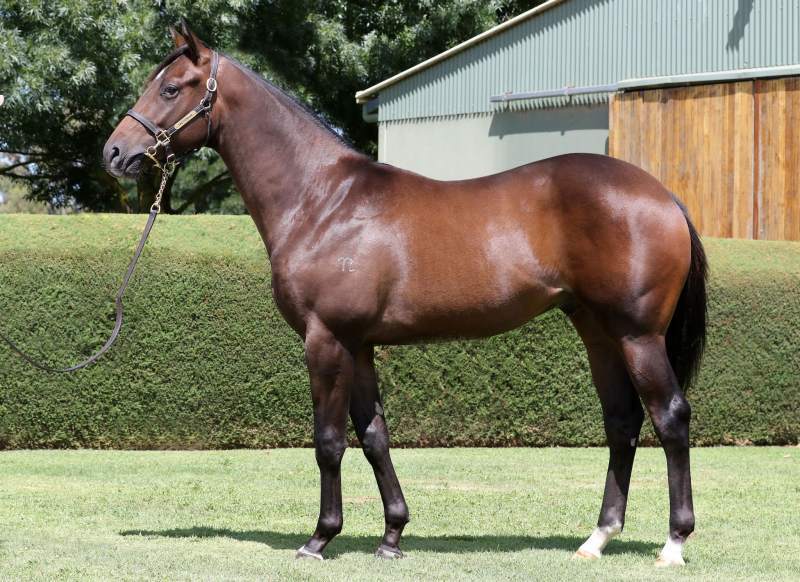 Lot 662 – Artie Schiller x Sulmita – An early well-grown, strong filly. She is well balanced, correct and athletic. Second foal, Grand dam is Spy’s Lass, a ½ to Another Victor. 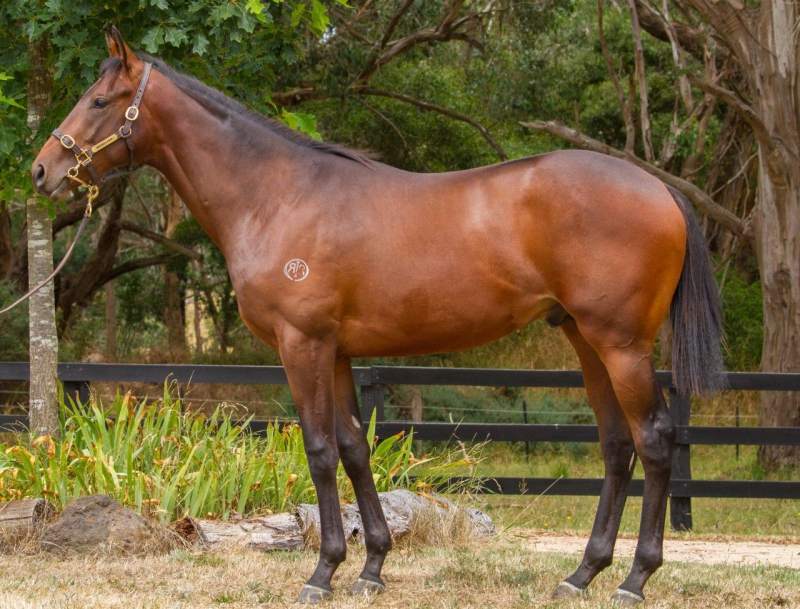 Lot 710 – Fiorente x Cahuenga – A great first foal that shows a lot of quality. Lot 719 – Bel Esprit x Confederate Rose – Strong, correct, and well-balanced filly with a lovely walk. Horses bred at Hillside Thoroughbreds have been racing in fine form leading into this weekend’s Inglis Melbourne Premier Yearling Sale, the boutique farm rapidly gaining a reputation for producing high quality performers. 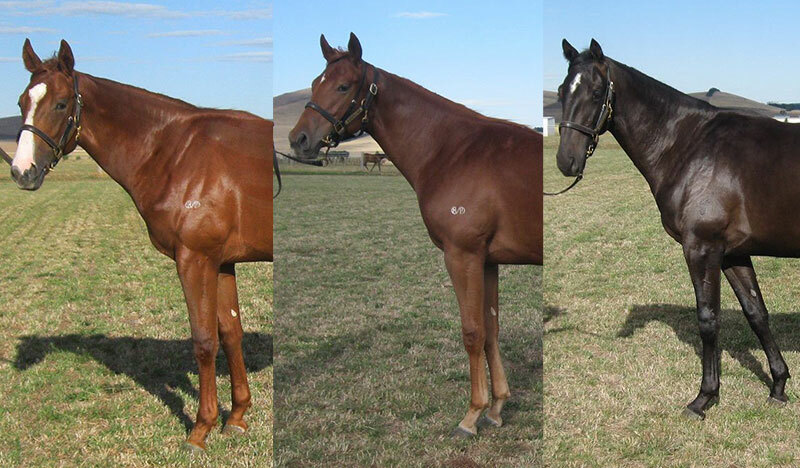 These include Wakeful Stakes winner Tiamo Grace, the New Zealand Derby bound Mongolian Wolf, the debut Moonee Valley winners Areti and Something Violet, the in-form Hong Kong galloper House Of Fun, the triple Group winning Perth filly Whispering Brook and Flemington juvenile winner King’s Authority. Well worth noting is that Hillside have fared especially well at the Melbourne Premier; over just four years at the sale providing 28 runners – 16 winners with an outstanding 25% city winners to runners strike rate! And their nine 2017 Melbourne Premier yearlings by the likes of Snitzel, Epaulette, So You Think, Medaglia d’Oro and Dundeel are bound to be keenly sought after. Hillside Thoroughbreds is housed in Barn H, stables 139 – 147. You can also visit the draft online. Moorookyle Park’s Nioka Wozny is looking forward to showcasing a small, but select group of yearlings at this weekend’s Inglis Melbourne Premier. She could not be happier with the progress of the well related trio; sons and daughters of the in-form stallions Written Tycoon and Magnus as well as one by exciting up and comer Sizzling. First cab off the rank for Moorookyle is lot 314, an eye-catching chestnut by one of the country’s most popular stallions, the prolific Written Tycoon. Constantly in the headlines of late, Written Tycoon has been well represented by recent stakes winners Winning Rupert, Grande Rosso, Hot Dipped, Music Magnate and Super Cash – as well, of course, as last year’s Golden Slipper winner Capitalist. A colt who bears a definite stamp of his sire, this Super VOBIS nominated August foal is out of the winning Reset mare We Belong, a half-sister to the dual Group and three times Listed winner Conservatorium. It is worth nothing that whilst Written Tycoon’s overall winners-to-runners strike rate sits at over 70%, his winner ratio with mares carrying a Sir Tristram strain is an even more impressive 75.5%! Which is where of course Written Tycoon inherits his own flashy looks. Also Super VOBIS nominated is lot 580, an imposing Magnus filly out of the metropolitan winning mare Mikumi, a half-sister to this season’s Group 1 Railway Stakes hero Scales Of Justice. “A well grown filly with an absolutely beautiful temperament,” this chestnut is a descendant of one of Victoria’s best and most popular mares, the great Dual Choice. And her sire, who boasts a strike rate of just under 70%, has been in rare form – the progeny of Magnus already winning 29 races this year! And amongst that excellent tally are the talented stakes winners Malaguerra, Great Shot, Volcanic General and The Alfonso. The first crop of Group One winning sprinter Sizzling (son of the hot Snitzel) have been in high demand at the sales and Moorookyle’s colt out of the stakes winner Real Quiet mare Really Flying is an eye-catcher. A half-brother to the Group Three winner Camporella (also winner of the Perth Magic Millions 2YO Classic), this BOBS eligible colt hails from the family of wonderful broodmare Twiglet, dam of Group One gallopers Fairy King Prawn and Easy Rocking – and grandam of dual Group One winner Cosmic Endeavour. Boasting a pedigree of considerable depth with a 6 X 4 cross of the legendary Nijinsky II, he also carries three strains (His Majesty, Real Quiet, Whiskey Road) of the prolific Boudoir II family. Moorookyle Park’s yearlings are housed in Barn E, stables 34 – 38 or visit the draft online at moorookylepark.com.au. Rush to Visit this Draft! 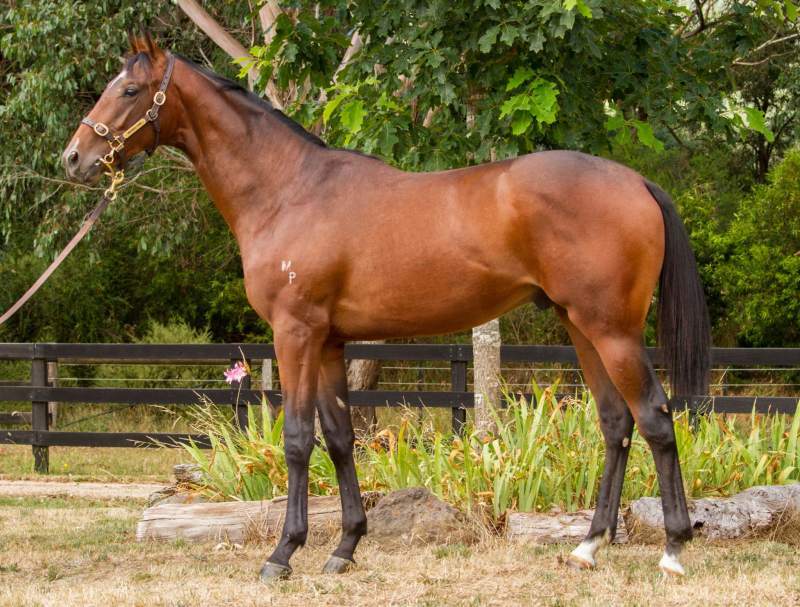 The Rushton Park Inglis Premier draft has one of only two Fastnet Rock fillies in the sale, has the full sister to Kiwi star Volpe Veloce, has the sibling to Group I stars St Basil and Pantani, has a close relation to Houtzen as well as colts by the sires of Flying Artie and Capitalist. Is it any wonder yearling buyers are beating a path to Barn H Stables 59-62, 70-79, 94-101! 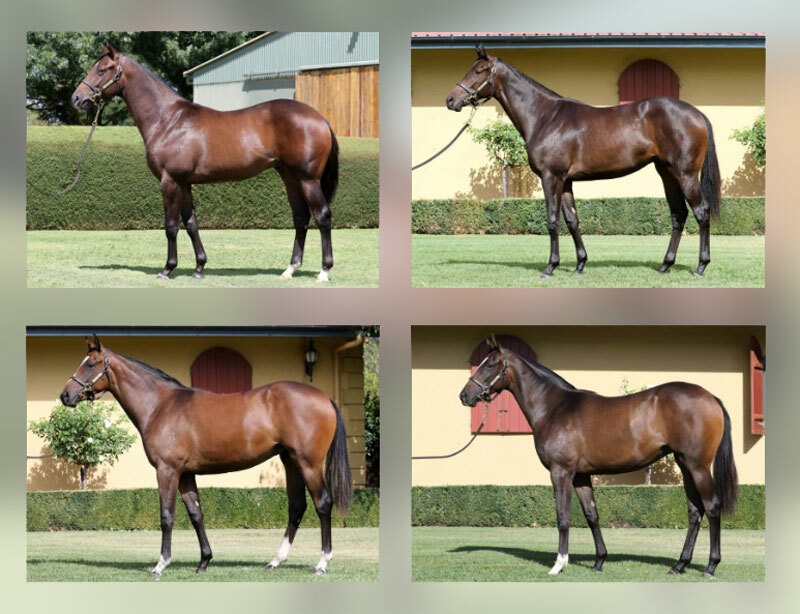 Rushton Park are presenting 20 stunning yearlings with highlights below and to see the full draft click here. One of only two fillies in this sale by the champion sire Fastnet Rock, who has five runners in the Blue Diamond headed by the favourite Catchy. First foal of brilliant Group III winner Lady Melksham, a daughter of Flying Artie’s sire Artie Schiller. First foal of a half-sister to Group I winners St Basil and Pantani and is by leading Victorian sire Magnus. Half-brother to four winners including highly promising New Tipperary (4g High Chaparral), who has won six of nine starts and resumes from a spell in the Group III ATC Liverpool City Cup on Saturday. New Tipperary is entered for the Group I Doncaster and Queen Elizabeth so connections have high hopes for him. From a half-sister to Group I winners Assertive Lad and Assertive Lass, the dam of unbeaten Group I winning sire Reset. 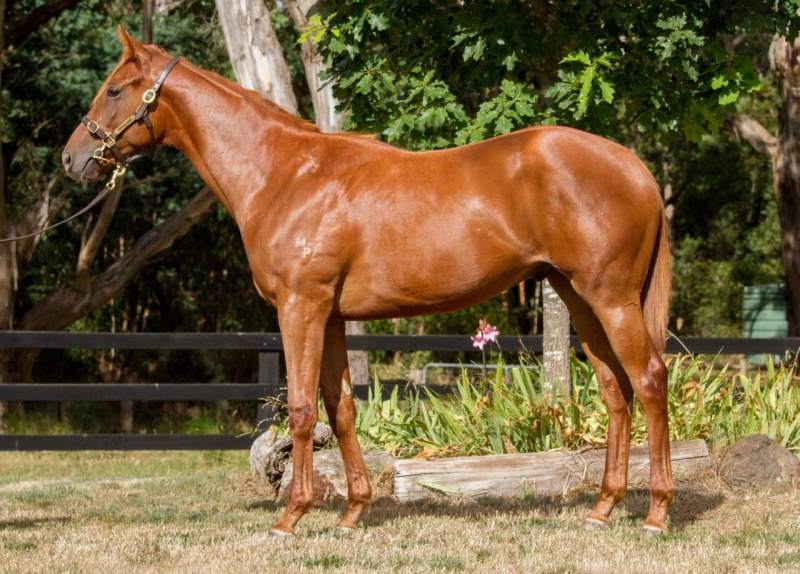 Three-quarter brother-in-blood to very smart metro winner of over $400,000 in prizemoney in Written, tracing back to a European Black Type family. Full sister to star Kiwi filly Volpe Veloce, who won her first seven starts in succession including the Group II ARC Eight Carat Stakes and Group III Manawatu RC Eulogy Stakes. Half-sister to stakes-winner Delago Bolt from Group III winner Bardego. Half-brother to $1.1 million earner St Basil, winner of the Group I BRC Stradbroke Handicap and Pantani, winner of the Group I SAJC Adelaide Cup and South Australian Derby. Very closely related to St Basil as he was by Vettori, the sire of the dam of Lope de Vega. From the first crop of Melbourne Cup and Australian Cup winner Fiorente and is a half-brother to Group II placed Flying Light from stakes-placed Fly Higher. From the first crop of exciting first season sire Eurozone and has a massive pedigree update as she is from a half-sister to the dam of unbeaten Magic Millions 2YO Classic winner Houtzen. For Rosemont Stud boss Anthony Mithen, readying the troops for the Inglis Melbourne Premier Sale is like preparing for a home ground Grand Final. 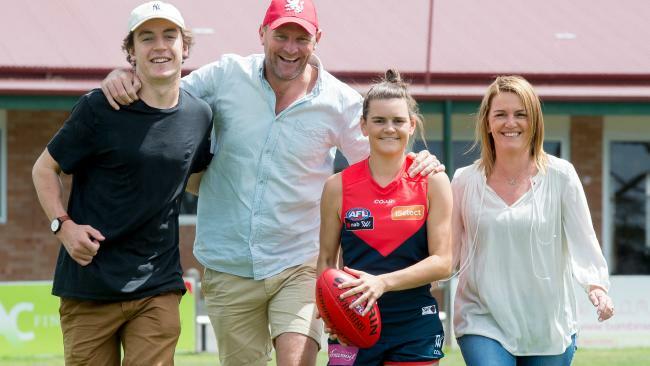 And given the form of daughter Lily Mithen, who plays for Melbourne in the inaugural AFL Women’s competition, the Rosemont family may well have two Grand Finals to celebrate in the next month. “She’s going well so far and so is the team (Melbourne) so they’re a chance to be there at the end (of the season),” Mithen said. Added to that was the Group 2 win Hey Doc on the weekend at Flemington. Rosemont prepared the now 3yo gelding for the Inglis Premier Sale of 2015. Given the strength of Rosemont’s 2017 Premier Sale draft, continuing that good run of form won’t be an issue. The 30-horse draft is typical of the yearling spread that Rosemont puts on each season; tough, athletic horses, with a strong nod to proven colonial sires. There are four yearlings by former resident stallion Starspangledbanner, a sire that continues to maintain a very strong stakes winners to runners ratio of 12.3% despite fertility problems during his career, including a highlight colt by the Sebring mare Splendid Eagle. “Lot 265 is a ripper,” said Mithen. Then there are three colts by Rosemont stallion Starcraft, a horse that is enjoying a serious resurgence in the last twelve months thanks to the deeds of stakes winning two-year-old Property and Hong Kong Group 3 winner Blizzard. “The Starcrafts as a breed are just super tough and very reliable,” Mithen said. The Australasian yearling sale focus switches to Melbourne for the four-day Premier Yearling Sale, beginning on Sunday. A total of 771 horses have been catalogued for Premier, among them 103 relations to Stakes winners and 104 progeny of Stakes-winning mares. More than 500 of the lots are Super VOBIS nominated. Sunday’s opening day will again feature the popular Blue Riband session, where yearlings considered to have the pedigree and conformation to excel in their Classic Year and beyond have been specifically selected. Last year the Session 1 average was up 14% to $111,000 while Session 2 shot up by a whopping 43% to almost $46,000. Just seven years ago, the Session 1 average was only $55,000. 58 Victorian vendors have 602 catalogued lots representing the biggest number ever except for 2008 which was unique due to the travel restrictions associated with the Equine Influenza outbreak. Supreme Thoroughbreds has the largest draft this year with 40 lots in its Oaklands Junction consignment. “This is easily our biggest and best ever (for Premier Sale),” says Supreme’s Sue Shaw. “With 16 fillies and 24 colts, we are presenting a diverse group of yearlings by most of the leading stallions out of first-rate mares that are all well-bred with strong pedigrees,’’ Shaw said. Inglis’ Victorian bloodstock team has for almost a fortnight been doing on-farm inspections around Victoria of the yearlings entered for the sale. Last week, they finalised their on-farm inspections accompanied by dozens of potential buyers. 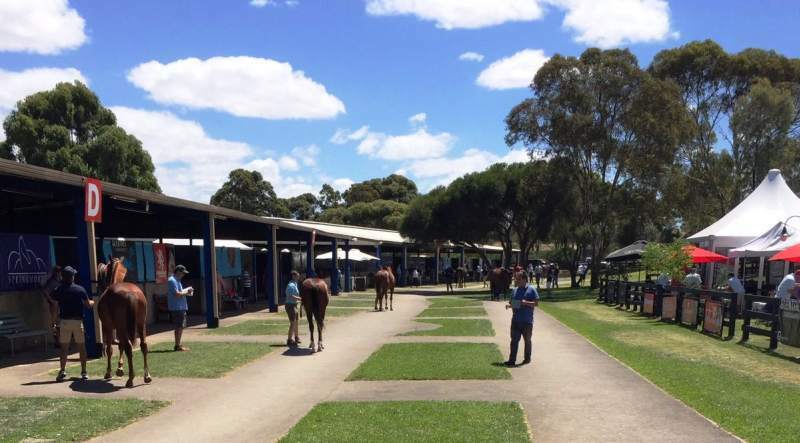 Inglis’ Victorian Bloodstock Manager Simon Vivian believes the success of the Classic Sale in Sydney earlier this month bodes well for a big Premier Sale. “The strength of the yearling market allows us to go into Premier with plenty of confidence,’’ Vivian said. “The broad appeal for Premier is attributable to well-conformed yearlings by a great variety of stallions, which has been proven year after year. “Graduates of the Melbourne Premier Sale continue to perform well on national and international racetracks and this provides buyers with great confidence in the product on offer. The good-looking Hey Doc was certainly turning heads at Flemington even before the C.S. Hayes Stakes was run. But he is not just a pretty face, as underneath he is a tough and smart galloper with a high cruising speed and an impressive finishing kick. 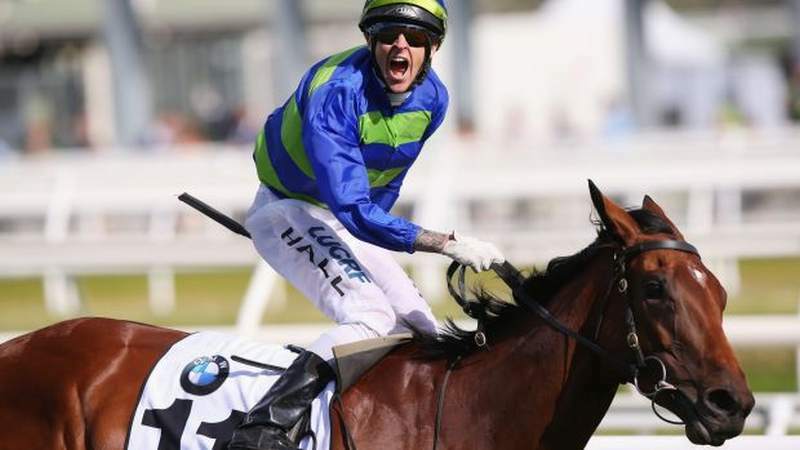 And that was just what Hey Doc showed his admirers, when the three year old gelding exploded away over the final 300m to win the 1400m Group 3 at Flemington on Saturday. The three-year-old gelding is a son of Duporth and is out of the General Nediym mare, Heyington Honey. Behind the breeding and upbringing of Hey Doc is Adrian Hall. Based in Yarram in South Gippsland, Adrian is a small breeder who has kept a share in the horse after selling through the Inglis Premier Sale. “It would be nice to keep a share in all of them, but I really liked him and spoke to Tony to stay in him,” Adrian said. With prize money over $500,000, he is glad he did. 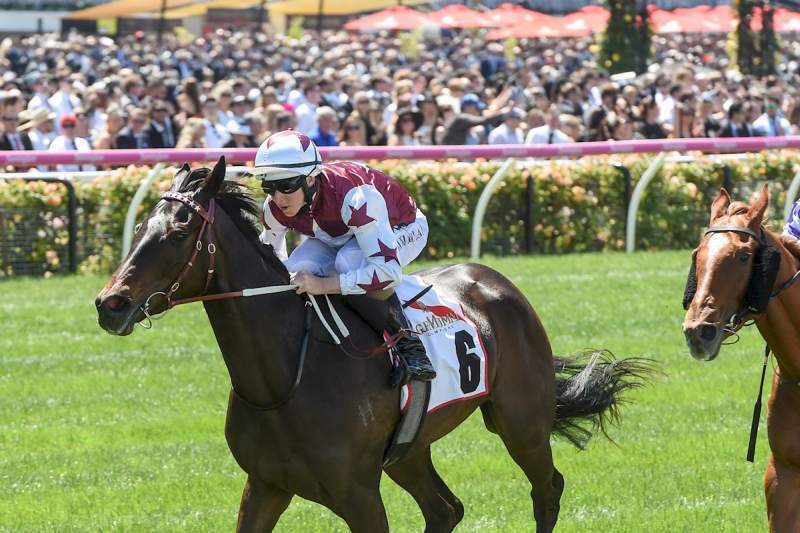 “It would be very nice to breed and race a Group 1 winner,” Adrian said as he looked forward to the gelding’s next hit-out in the famed Australian Guineas. 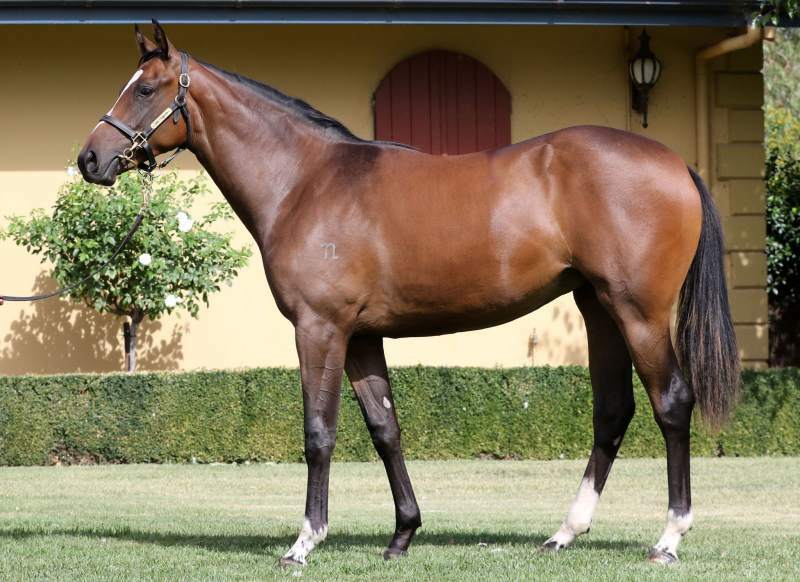 Hey Doc was prepared by Rosemont Stud for the 2015 Inglis Premier Sale and was catalogued in session two. “It was a shame he wasn’t in the first session but his breeding wasn’t commercial,” Adrian said. Unfortunately Adrian lost Heyington Honey after only producing two foals. The half-sister, Heather Honey (Congrats) is currently racing with Simon Morrish at Ballarat. “After five second placings, she won her maiden three weeks ago and picked up a nice VOBIS Gold bonus too! Meanwhile, Hey Doc, with five wins in just the eleven starts, is favourite for the Australian Guineas in two weeks time. A win in the big race at Headquarters could make him the most famous product to ever come out of his South Gippsland hometown. Miranda Park makes a Premier debut! Hesket’s Miranda Park will be making its debut at the Inglis Premier Yearling Sale next week with a small, but impressive draft of colts. And owners Gary and Helen O’Meara are excited. 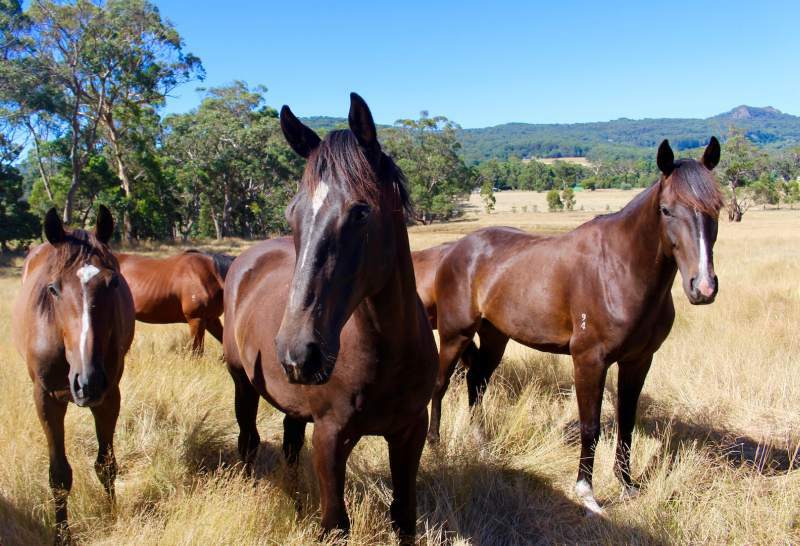 They will offer four colts, all by different sires, and will be located in Barn G.
Established in 2003 in the heart of the Macedon Ranges, Miranda Park comprises 200 acres of lush pastures with a mix of creek flats and rising terrain, ideal for breeding and raising thoroughbreds. Mount Macedon looms to the south of the property while Hanging Rock catches the eye from almost every vantage point of the farm. Gary’s experience in the horse industry is broad, and includes time spent as a horse breaker, amateur jockey, owner-trainer and long-term member of the Kyneton and Hanging Rock Race Club committee. Helen has many years of experience in foaling down mares and general horse husbandry among many other worldly talents. Gary provides a run-down on each of the four colts that will make the short journey down to Oaklands Junction. A half brother to the Group 3 winner Flying Tristram. He is out of a city winner My Southern Bell, from the family of Dance Hero. His half brother Lightning Bell won on the Sunshine Cost on Sunday. A typical Reward For Effort, stamped by his sire. A strong yearling with good depth, terrific shoulder and hip, and a loose fluent walk. A lovely natured colt, easy to handle and manage. A three quarter brother to Divine Mr Artie & Divine Chills, from the half sister to the dam of Blondie, who is likely to run in the Group 1 Blue Diamond. This colt is bred on the same cross as Flying Artie and is similar in appearance. A high quality colt, popular in the pre-inspections, he has had many admirers and should top the draft. Owned for many years by Miranda Park; the dam is a lovely type that produces well-conformed progeny. This colt is bred on a cross of 11 to race for 9 winners and 4 stakes-winners including Epsom winner Hauraki, triple Group 2 winner Set For Fame and VRC Derby winner Rebel Raider. This colt is a good size, has a great attitude and is strong and correct. He was an outstanding paddock galloper, and in a group he showed a lot of speed. Bred by Miranda Park, the dam was a consistent galloper trained by Tommy Hughes. Autilla is a half sister to Flawed Logic, from the family of top sprinter Gold Kildare. This is a real trainer’s horse as he is athletic mover, with a beautiful walk that uses his whole body. 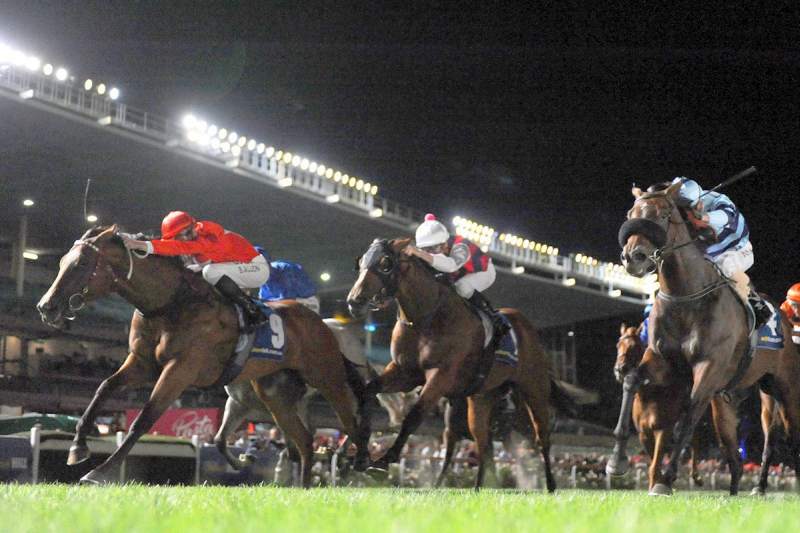 Seven year-old mare Pretty Possum gave connections plenty of reason to celebrate at Moonee Valley on Friday night. Co-owners Dr Caroline Duddy and her husband, Russell Osborne – also the mare’s trainer – were absolutely thrilled with the win in the Inglis 55 Second Challenge over 955 metres. A homebred by their stallion Hillman, out of the Lion’s Cavern mare, Lion’s Kiss, Pretty Possum has been an ever consistent mare over sixty career starts. Friday’s victory was her 11th for total earnings of more than $292,000. Using her speed she travelled two lengths clear mid race, and when challenged on the straight she really dug deep and held on for a close, tough win. “She’s been a very good mare for us. She’s hardly ever run a bad race and nearly always picks up a cheque,” breeder, trainer and owner Osborne said. “She jumps away so fast, sometimes she has left the jockey behind but Brooke (Sweeney) rides her and knows what to expect. “I’ve been trialing her, I’ve been doing everything really with her, and Russell had her spot on. When I jumped her out on Monday morning she showed me that much speed I just said let’s go”. And go she did!” Sweeney said post-race. Caroline and Russell bought Pretty Possum’s dam, Lion’s Kiss, at a mixed sale for only $1500 as a tried horse. Although Osborne didn’t know the dam’s breeders at the time of purchase, Sandra Lawrence and Ross Wilkinson were long term clients and good friends. Caroline said Sandra unfortunately passed away a couple of years ago due to Motor Neuron Disease. Following the purchase, Osborne trained and raced Lion’s Kiss to a win in the country before breeding with her at their Benalla based Riverbank Farm. Pretty Possum has a full sister called Brilliant Beaver and a half brother by their stallion Redente called Squeaky Squirrel. Caroline and Russell run a busy operation at Riverbank. As well as the stallion, broodmare and training duties, Caroline works a vet to many equine operations in the north-east region. She was also recently elected to the TBV Committee! “I do the training side myself with my daughters Sarah and Olivia and Caroline does a lot of the stud work,” Osborne said. The hard work by the family has certainly paid off in recent times. Riverbank Farm based stallion had just the 19 mares visiting him in 2013. This year, he broke the magical century barrier and covered 103 mares. Similarly, Von Costa De Hero almost doubled his book this year going from 16 mares covered in 2015 to 30 last season. Redente’s siring success could be seen last week with five-year-old Redente’s Edge saluting the judge on both days of the Kangaroo Island Racing Carnival. Trained by Dennis O’Leary and ridden by Victor Wong, Redente’s Edge won on Thursday, before backing up again to win on the Saturday.